Home Ecology Spinach vs. Kale: Is One Healthier? Though they hail from entirely different plant families, they’re often used interchangeably in recipes ranging from salads to soups to smoothies and beyond. Still, despite their many similarities, several distinctions set them apart. This article takes an in-depth look at the nutritional content and benefits of spinach and kale to determine which is healthier. Both kale and spinach are highly nutritious, low-calorie vegetables that provide a wide array of important vitamins and minerals. They’re both high in vitamin K — a key vitamin involved in healthy blood clotting and bone formation (1). Plus, they’re rich in vitamin C, which plays a central role in disease prevention and immune function (2). Both also contain fiber and several other important micronutrients in varying amounts, including vitamin A, riboflavin and calcium. Spinach and kale offer a similar amount of several nutrients, but there are some differences as well. For instance, kale contains more than twice the amount of vitamin C, while spinach provides more vitamin K, vitamin A and folate. Still, though spinach and kale have different concentrations of certain nutrients, they’re both highly nutritious vegetable choices overall. Spinach and kale are both low in calories but contain varying amounts of fiber, vitamin K, vitamin C and several other micronutrients. In addition to their stellar nutrient profiles, both kale and spinach have been linked to impressive health benefits. Both are rich in antioxidants — compounds that help prevent oxidative damage to your cells and protect against chronic disease (4, 5). They’ve also each been shown to positively impact heart health by improving several heart disease risk factors, such as high cholesterol and blood pressure. For example, one 12-week study in 32 men with high cholesterol showed that drinking kale juice with meals improved cholesterol levels and increased antioxidant status (6). Meanwhile, a small study in 27 people found that eating a soup made with about 9 ounces (250 grams) of spinach for just 7 days improved blood pressure. The study observed that the spinach soup significantly reduced both systolic and diastolic blood pressure thanks to dietary nitrates, compounds that increase blood flow (7). Both vegetables also contain cancer-fighting compounds, which have been shown to decrease the growth and spread of cancer cells in test-tube and animal studies (8, 9, 10, 11). What’s more, because kale and spinach are low in calories yet high in nutrients, adding these tasty greens to your diet can be an effective strategy to boost weight loss (12, 13). Spinach and kale are high in antioxidants and cancer-fighting compounds. Both have been shown to reduce several heart disease risk factors and may aid weight loss. Spinach contains large amounts of dietary oxalate, a compound that binds to calcium in your body, preventing its absorption (14). Eating oxalate-rich foods also increases the excretion of oxalate through your urine, which can lead to the formation of calcium oxalate kidney stones (15). There are several different types of kidney stones, but it’s estimated that about 80% are composed of calcium oxalate (16). Those who are at high risk of kidney stones are often advised to limit their intake of foods high in oxalate, including spinach (17). Boiling spinach can reduce the concentration of dietary oxalate by up to 87% (18). Spinach contains oxalate, which can prevent calcium absorption in your body and may contribute to kidney stone formation. Cruciferous vegetables, such as kale, contain goitrin — a compound that may interfere with thyroid function by decreasing the uptake of iodine, which is necessary for the production of thyroid hormones (19). Spinach may also contain goitrogenic properties, though not to the same extent as cruciferous vegetables like kale. Disruptions in thyroid function can impact your metabolism and cause symptoms like fatigue, sensitivity to cold and weight changes (20). However, recent research suggests that eating goitrogen-rich foods in moderation is unlikely to cause issues for most people. For example, human and animal studies show that eating broccoli sprouts and Brussels sprouts doesn’t affect thyroid function or thyroid hormone levels, suggesting that it’s safe for those with thyroid issues (21, 22). Other research has found that regularly eating cruciferous vegetables is not associated with a higher risk of thyroid cancer — except for in women with a very low intake of iodine (23, 24). Additionally, cooking vegetables deactivates the enzyme responsible for the release of goitrin (25). Therefore, if you have thyroid problems, cooking kale or spinach prior to eating it and ensuring you get enough iodine in your diet from foods like seafood and dairy can help prevent any side effects caused by goitrin. Kale contains goitrin, a compound that can interfere with thyroid function. 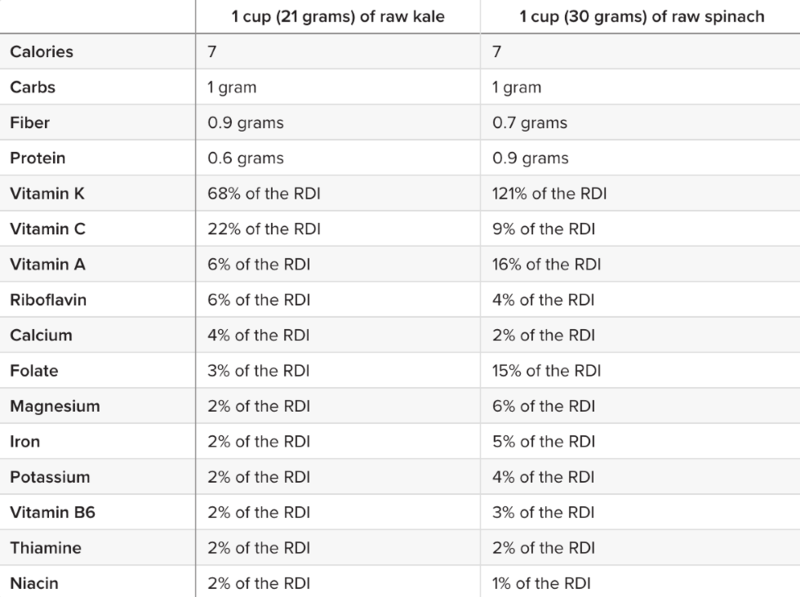 Eating enough iodine and cooking kale before eating it can help prevent any potential negative side effects. There are several small differences in the nutritional content and health benefits of kale and spinach. Still, both are incredibly nutrient-dense and can be enjoyed as part of a well-rounded, healthy diet. Ideally, try incorporating a few servings of each into your weekly meals, along with an assortment of other leafy greens, such as romaine, Swiss chard, collard greens and cabbage. Not only do each of these ingredients bring a different set of nutrients to the table, but they can also add a bit of variety and new flavors to your diet. Add kale or spinach to a salad topped with vegetables and a good source of protein. Use kale or spinach as a topping for your favorite dishes, including sandwiches, tacos, pasta or casseroles. Try sautéing and seasoning kale or spinach as a healthy side dish for your main courses. Combine your choice of greens with other veggies and eggs to make a hearty breakfast scramble. Whip up a green smoothie using kale, spinach and a few of your favorite fruits and vegetables. Kale and spinach may differ slightly in terms of nutritional value and health benefits, but both can be included as part of a healthy diet. Kale and spinach are highly nutritious and and associated with several benefits. While kale offers more than twice the amount of vitamin C as spinach, spinach provides more folate and vitamins A and K.
Both are linked to improved heart health, increased weight loss and protection against disease. Therefore, enjoying both as part of a healthy, balanced diet can ensure you’re able to take advantage of the unique benefits that each has to offer — while also adding a bit of variety to your daily meals.